Sisera was the captain of the army of Jabin, king of Canaan. He lived in Harosheth of the Gentiles. After his army was routed by Barak and Deborah on the plain of Esdraelon, Sisera fled to the tent of the Kenite chieftainess, Jael. He accepted Jael's invitation to enter her tent, and she covered him with a mantle as he lay wearily on the floor. When thirst kept Jael from sleeping, and he asked for water, Jael brought him buttermilk in her finest vessel. At last, with a feeling of perfect security, Sisera fell into a deep sleep. Then Jael took one of the great wooden stakes which fastened down the cords of the tent, and with one terrible blow of a mallet, dashed it through Sisera's temples deep into the earth. She then watied for the pursuing Barak and led him into her tent so she might claim the glory of Sisera's death. 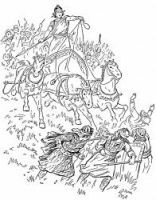 On this page you'll find seven illustrations of Sisera taken from my collection of antique Bibles and story books. You're welcomed to use these pictures of Sisera in your artistic creations. Click on the Sisera pictures below to see more details about saving a free Sisera image or about purchasing the images of Sisera at a higher resolution.